Now a section of Liberty State Park (along Morris Pesin road including the park office and Flag Plaza), Black Tom was originally a small island in New York Harbor not far from Liberty Island. 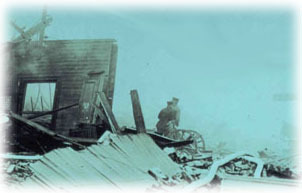 Between 1860 and 1880, Black Tom was connected to the mainland by a causeway and rail lines terminating at a freight facility with docks. The area between the island and the mainland was filled in sometime between 1905 and 1916 by the Lehigh Valley Railroad as part of its Jersey City facility. 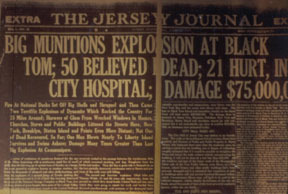 By the beginning of the twentieth century, Black Tom was serving as a major munitions depot. Before the United States entered the First World War, American businessmen would sell their supplies to any buyer. However, by 1915, the British Navy had established a blockade effectively keeping the Germans from being able to buy from the American merchants. The German government, on July 30, 1916, orchestrated the sabotage of freight cars at Black Tom, which were loaded with munitions for the Allies in Europe. According to a recent study, the resulting explosion was the equivalent of an earthquake measuring between 5.0 and 5.5 on the Richter Scale. Windows within a 25-mile radius were broken, the outside wall of Jersey City’s City Hall was cracked and pieces of metal damaged the skirt of the Statue of Liberty (it is because of this explosion that the Lady's torch has been closed off to visitors). Most of the immigrants on Ellis Island were temporarily evacuated. Losses were estimate at $20 million and seven people were killed. After the war, a commission appointed to resolve American claims against Germany was established. It took years before a decision was made, finally in June of 1939, the commission ruled that the German Government had authorized the sabotage. However, World War II interrupted any chances of arranging for restitution. In 1953 the two governments finally settled on terms that the German government would pay a total of $95 million for a number of claims including Black Tom. The final payment was received in 1979.